If you delete a synchronized file on your Pocket PC or on your desktop PC, that file is also deleted from the other PC the next time you synchronize your files. If you somehow think you’ll remember to copy the file someplace else before synchronization and thereby protect it, good luck! Old Murphy is sure to step in and make certain that you pop that Pocket PC into the cradle without remembering to make your copy. If you have to do a hard reset (the same thing as a cold boot on your desktop PC) on your Pocket PC because of a system problem, any files on your Pocket PC will be lost. Isn’t it a good bet that this will happen just before you were going to synchronize your files? If a synchronized file somehow becomes corrupted on either your Pocket PC or on your desktop PC, you won’t be able to complete the synchronization until that file is deleted. And of course, the corrupt file will almost certainly be one that you’ve spent hours on, or one that you can’t re-create easily. When you back up the files from your Pocket PC, all your data files, any programs you’ve installed, and any settings that you’ve adjusted on your Pocket PC are saved in a file on your desktop PC’s hard drive, which essentially protects your entire investment of time that you’ve placed in your Pocket PC. A full backup saves everything on your Pocket PC that can be backed up. Full backups take a little longer and use more disk space on your desktop PC, but because everything is backed up in one file, you don’t have to worry about where your backed up data may be. An incremental backup saves only items that are new or have been changed since the last backup. Incremental backups are usually somewhat faster than full backups, and they generally take less disk space. Of course, this can vary according to how much you’ve done with your Pocket PC since the last backup. Allow plenty of time for a full backup to finish. Depending on the method you use to connect your Pocket PC to your desktop PC and the size of the backup, the entire process can take anywhere from a few minutes to over an hour. 1. Make certain that your Pocket PC is connected to your desktop PC. This usually means placing it in the synchronization cradle, but you have to determine the proper method in your case. 2. Open ActiveSync by clicking the ActiveSync icon and choosing Open Microsoft ActiveSync from the pop-up menu. You can skip this step if the ActiveSync window is already open on your desktop. 3. 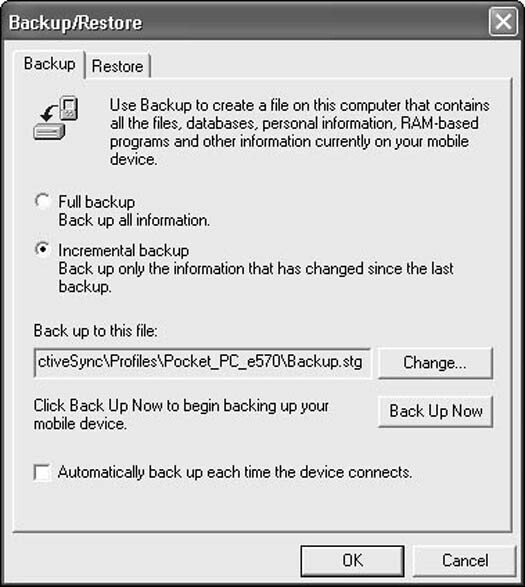 Select Tools –> Backup/Restore from the ActiveSync menu to display the Backup/Restore window (see Figure 1). Figure 1: Use Backup/Restore to protect the files on your Pocket PC. 4. Choose the backup method you prefer. The first time you do a backup, both options will function the same way. 5. If you want to keep more than one full backup, click the Change button and specify the name for the backup file. If you use the default name, new full backups overwrite older ones that use the same name. 6. Click the Back Up Now button to begin the backup. After you click the Back Up Now button, you must leave your Pocket PC alone and connected to your desktop PC until the backup is completed. If you remove your Pocket PC from the cradle before the backup finishes, you run a high risk of corrupting the backup file. 7. Click OK to complete the backup. Restoring your files from an existing backup replaces the files that are currently on your Pocket PC with the files from the backup. If you’ve made changes on your Pocket PC, those changes will be lost. 1. Make certain that your Pocket PC is connected to your desktop PC, and then open ActiveSync (if it isn’t already open). 2. Select Tools –> Backup/Restore from the ActiveSync menu. 3. Click the Restore tab. 4. Click the Restore Now button. 5. Click the Restore button to confirm that you do indeed want to begin the restore. You can’t cancel this after the restore has begun, so don’t click this button unless you’re absolutely sure. 6. Wait until the restore finishes and click OK. When you finish the restore, you’re prompted to remove your Pocket PC from the cradle, reset it, and then return it to the cradle. You may then be asked how to resolve a number of items that need synchronization. If so, choose the option that best suits your needs and complete the task.